View of the drillfield, intermediate memorial construction, and Burruss Hall from the War Memorial. Photo taken July 6, 2007. Construction of an intermediate memorial in front of Burruss Hall is currently underway. Photo taken from the middle of the drillfield on Sunday, June 17. 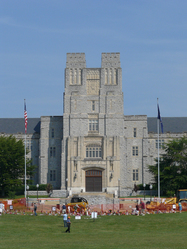 Construction of an intermediate memorial in front of Burruss Hall is currently underway. The semicircle of Hokie Stone victim memorials have been moved forward to make room for the renovations. Photo taken Thursday, June 14. Construction of an intermediate memorial in front of Burruss Hall is currently underway. The face of Norris Hall is visible to the right. Photo taken from the middle of the drillfield on Sunday, June 17.